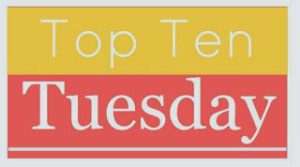 The good folks at The Broke and the Bookish have a weekly meme post called Top Ten Tuesday. This week’s topic is blogging confessions, so I really must join in. Here are ten confessions from me. 1. I need absolute silence to write. I can tolerate a low level of white noise such as an aquarium pump. Music, never. If there’s noise around and I must write, I tune it out and write more slowly. 2. Sometimes I blog about political things. I am always conflicted about that, right up to the moment I press the publish button. I have a strict rule (80/20 max) about the ratio of pop culture and social media content to political content here. I don’t want to be a political blogger. Usually, when I write about political stuff, it’s because I’m looking at something that I view as either too ugly to let pass or patently ridiculous. 3. I’m not really a social media wizard, despite the persona. I’m a speed-reader, I’m good at research, and I have a talent for figuring out what works and sticking with it until it doesn’t. I also have a talent for letting things go when they don’t work. 4. I’m always stressing out about not reading and commenting on other blogs more. The kind of social media network I want is one that runs on interaction and reciprocity. I often feel like I am not holding up my end. 5. I blogged at Blogspot, years ago, under a pseudonym. Later I had a WordPress blog for a few years that I’ve since deleted. During that first WordPress phase, I was experimenting with cross-network engagement, but the tools weren’t there to make it workable for a guy with a full-time job to manage. 6. Diana, my sister, credits me with the idea for these blogs. I suppose that’s fair enough. I never would have jumped back into blogging, though, if I hadn’t had contributors offering to pitch in and if Diana hadn’t pushed me along. When she called me last October and told me she’d started blogging, I kicked my own plans into high gear. 7. I wish we’d blogged for the first month, but not published anything. We’d likely still be a couple of weeks ahead and the last 8 months would have gone much more smoothly. I also wish I’d taken the number of photos I’ve taken this summer last summer before we started. An archive of original images is a real asset. 8. My goal from the beginning has been to get three blogs posting every day, keep them posting every day, and answer comments. Aside from a couple of hiccups, I’ve managed to do that with the help of contributors and by virtue of the fact that one of those blogs is Diana’s responsibility. I’m proud of this accomplishment. 9. I just love Twitter. If I suddenly found myself the sole content producer for all the blogs I contribute to, I’d keep one going, post every couple of days, Tweet like a madman on the days I wasn’t posting, and grow my Twitter following to 100k. 10. I am amazed at the awesomeness of the bloggers I’ve met since I started. Absolutely amazed. The conviviality and the conversations on the threads are my favorite part of blogging. This entry was posted in Books, Gene'O, Top Ten Tuesday and tagged blogging confessions, Blogs, blogwanking, confessions, Lists, musings, Part Time Monster, secrets, The Broke and the Bookish, thoughts, Top Ten Lists, top ten tuesday by Sourcerer. Bookmark the permalink. I was not aware that you and Diana were siblings. I may not have been paying close enough attention. it’s cool that you didn’t actually. Very amusing, given the length of time we’ve been chatting. One of us mentions it maybe once a week in a post ,at most. Sometimes we go a month without saying. We mention it sometimes if we’re doing formal introductions, but otherwise, we operate independently except for the fact that we’re in contact 23 hours out of the day via chat and share links, hehe. I need absolute silence to write also. I can deal with the sound my AC but anything else annoys/distracts me. I can do it with noise, but it makes the writing way harder. Like wading though molasses. I find you guys to be exceptional in responding to comments. I have a strict policy: If I read your blog and then make a comment on what you have written and you don’t acknowledge that, then you are rude an I’m not interested in what you have to say and you abviously don’t need or want me looking at your posts. Fair enough. My only exception to this is if a blog is really popular and each post gets many, many, comments, then I understand if I’m not responded to. Maybe. But if I’m the only commener, or one of three or four commenters, then you have no excuse. You guys have always displayed great manners. My policy is similar, but not quite as strict. I give second chances (but not third ones), and I make a similar allowance for blogs that obviously have too many commenters to answer. The worst is when I find a blog that I like, and it has no comments whatsoever on the last 10 posts, and only a couple of likes, and I leave a comment that doesn’t get an answer. Also, sometimes when I have nothing to say, I use the “LIke” as an acknowledgement. And sometimes I just miss comments, so I make allowances for that with other bloggers. Also – If i see two people talking to one another on my threads, I don’t interject anything unless I really have something to add, but typically as long as it’s an amicable conversation I like their comments just to let them know I saw it. One of the first things I look at when I discover a new blog is whether or not the people running it are making an effort to answer their comments. I need the correct environment to write. I don’t have any set plan, it’s most always on the fly. Wherever I’m at in the moment is where I go. I do need music leading up to starting a draft. Some Train, Eric Church or Diamond Rio here lately. I use music to put me in the mood, but once I actually start the writing, I don’t want to hear anything louder than a box fan. I write without a plan often – this post was written without any plan except “get this Top Ten Tuesday done before six,” lol. Loved this post! A countdown, a confession and insight into the mind behind the blog, it has it all! I’m so glad you liked it! This post saved my whole day, blogging-wise. Just based on what we’re getting on our reviews so far, I’d say True Blood is over already 😦 Which is sad. I didn’t realize you and Diana were siblings! I agree about reciprocal blogging culture–I respond to every comment, even if it isn’t instantaneous, and I often comment. It’s hard when I want to support someone but don’t have anything valuable to say, which is when that like button comes in handy. I totally agree about the likes! I was so happy when I figured out how to enable them for comments. Gene and Diane are the Luke Skywalker and Princess Leia of the blogosphere. It isn’t until about the second movie that people find out they are brother and sister. I’m giggling to myself so hard it’s embarrassing! Hopefully they’re not romantically involved, though. I think we all feel like we are not reading and commenting enough. There are so many great blogs and bloggers out there, it’s hard to keep up with all of them! That, plus writing, plus real life makes it all so crazy to keep up with! And you ARE a social media wizard! I probably wouldn’t even be on Twitter still if it weren’t for you! And I like to write with music on, but my issue has been noise from my kids this summer. I can’t even think straight with all of the kids home and it’s really stymied my writing which makes me seriously grumpy. *Also, I haven’t forgotten about the Writing Process Blog Tour, I am hoping to get to it soon! I’m glad you’re still on Twitter. I’m having a bit of a kid problem this summer, too. I’ve learned to just find a stopping point and do kid things when that happens. I can’t write with music on unless it’s very low instrumental music. If it has lyrics, I get distracted by them. “Interaction and reciprocity” are exactly what I look for in a blogging community as well! And I know that they’re possible because I had them in the past, with two blogging friends. When we left each other comments, they’d grow into long conversation threads . . . and often ended up inspiring other posts. I like to say that our blogs “cross-pollinated” each other! =) It was certainly a very organic way to blog, which is why I’m a little bemused by people who have very strict schedules. (They also tend to be the ones who say they have no time to respond to comments. I wonder when they’ll put two and two together . . .) What about the spontaneity of an interaction that grows into a post you never could have dreamed about on your own??? Unfortunately, my two blogging friends have since retired their blogs and moved on to different social media or to other interests. But how I miss those good old days! I like the “cross-pollination” analogy. That happens a lot around here. I wouldn’t blog if I didn’t have friends and readers interaction with me. It’s so much easier to scribble in a journal or play on Facebook.